Battery in my 2004 Frontier looks like it has a bad cell, on the charger overnight; I purchased that battery in 2012, so got good life from it, but that Frontier is up north and not in the heat desert of Phoenix. So that gave me time to do a decent search for a replacement battery for it, should I need one. It looks like width of the battery tray (about 6.8" on my 1998 Frontier) and maybe battery height may be the limiting factors, as it looks like the Frontier can accommodate battery length up to a 10.5". So I'll stick with Group 24 here. For my 4-cylinder Frontier I'd say all had sufficient CCA; all prices listed below are exchange. Autozone lists an Econocraft for $70 with a 3-month warranty, I did't want to chance that. I had a $10 coupon from O'Reilly, but using that still would've cost me $119 (600 CCA), same as the Walmart Everstart Maxx 700 CCA (made by Johnson Controls, who controls the US market), which I bought last year for my Mazda truck at the old price, the day prices were raised. 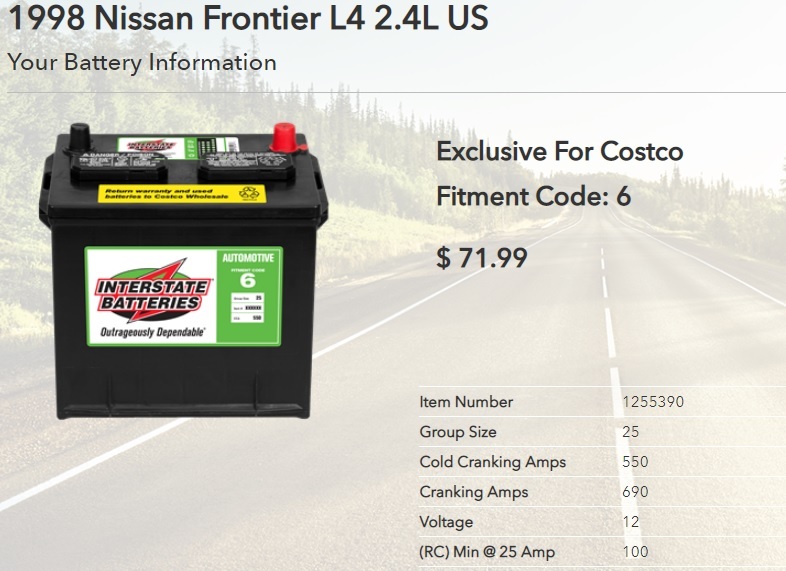 Costco has Interstate Batteries but does not give out their price by Internet or phone; I rode my bike over there to take a look-see, and Group 24 with 700 CCA is $95.99, looks like Interstate sells batteries also made by Johnson Controls. So looks like Costco for me if I need a new battery. Walmart isn't cheaper than Costco? By the way, the Costco site does show the price if you login. A lil more than a year ago I stumbled upon a brand new Optima Red Top model 3478DT (Johnson Controls) for $125 on the app OfferUp. No longer have to worry about corrosion on the terminals. I love this battery. It was my 2nd lucky find on that app. The 1st was a brand new a/c compressor for my truck that I got for $50. Curious, I must have missed something, but why don't you have to worry about corrosion on the terminals? The gasses don't escape? 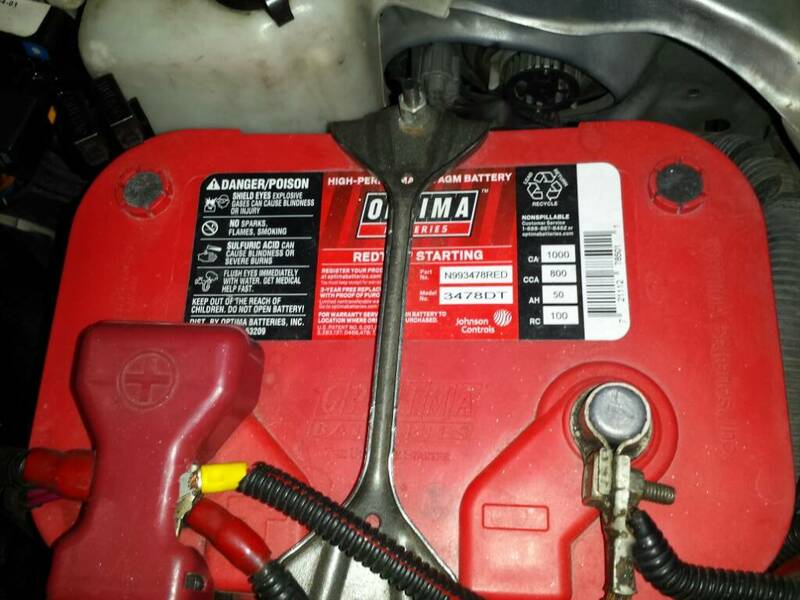 Optima Red Top is a AGM battery. Absorbent Glass Mat Batteries: Because of their glass separator construction, an AGM battery absorbs and retains the electrolyte leaving no free electrolyte in the cell to spill. ... The AGM battery is known as the most maintenance-free option in lead acid batteries because they recombine the internal gases back into liquid. Last edited by butterman2473; 03-27-2019 at 12:14 AM. Oh, thanks. But I haven't registered online, and did get a short bicycle ride in ! If I do need a battery, I'll look for that Group 25 one, as $23 less than the Group 24. But I looked yesterday (store had good stock), and didn't see any Group 25 (what Costco calls Fitment 6). I do have a Group 25 in my 1998 Frontier, but had a Group 24 in my 2004. Last edited by Cusser; 03-27-2019 at 08:38 AM. I created a Costco registration, and I can see prices online now, thanks. Trying to find out by chat if battery #852231 is in stock in my area. Won't they mail it to you? No, not available at all through Costco, and hazardous to ship sulfuric acid. Maybe not enough demand for Costco to bother with, I fully understand that. For example, Costco doesn't stock bottom-mount Group 42 like my two 1970s VWs use, just supply and demand. Since my 2004 Frontier is 100 miles away, and I'm not in a super-hurry to drive that, I'm currently trying to desulfate my battery using my old 4-amp Schauer batttery charger over the next few days. Yesterday the static charge was up to 1.8 volts. If I do decide to use that battery, I'll slip that into my 1988 Mazda truck and put the Mazda truck's Group 24 battery (new last summer, from Walmart) into the 2004 Frontier. Because the Mazda truck is only used local, and Walmart and Costco are 30 minutes closer to where that truck lives in case I need a new replacement. Why Costco and Walmart??? Because their warranties are significantly longer than higher priced batteries from O'Reilly and Autozone. Replacement 3.5 years at Costco and 3 years at Walmart.